For this feature we head to the class where the only thing bars are good for is drinking in, Super Street Bike. 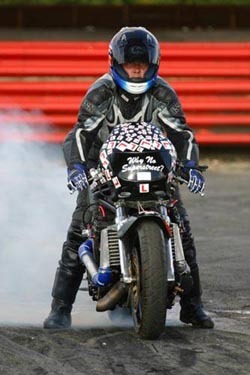 The spotlight falling this time on L Plate Racing and the only female rider to compete regularly in the class, Rachel 'Rat' Pattison. 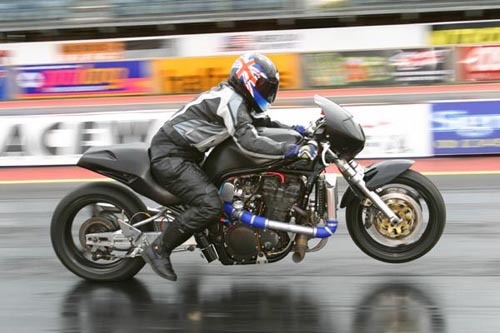 Rachel came up through the ranks of 9.90 Bike, and moved to Super Street Bike two seasons ago when she got fed up with slowing down to try and stay within the 9.90 index! Over the past two seasons she has constantly been evolving her bike to the point where she now holds the unofficial title of 'Quickest Bandit in Europe' with an 8.66/166 pass. Thanks to Rat for taking the time to complete this feature for us, and for not plugging her company too much! Rat: I own and run a motorcycle training school in Swindon, Abbey Rider Training, yep, that's Abbey Rider Training, 01793 705905. I live in a new mobile home which according to my team mate Beany Boy (Paul Newman - Features Ed), makes me a posh pikey! Beer, fags, knitting, calligraphy, you know - the usual stuff! Did I mention Abbey Rider Training? Rat: About eight or ten years ago at the Bulldog Bash. First time at Pod was about 1997 I think, to watch the Thunderball. Rat: In 1998 I took my old GS850 rat bike up the strip at the Bulldog. As I remember it just about made it to the end, and only just got me home too! In 1999 I took my brand new Bandit to the Bulldog and came third in the Japanese Lady class (that's the bike that's a Jap - not me)! In 2000 I went to the Bulldog, on the Bandit again, my sole intention this time was to win. Guess what - the trophy still has pride of place on my desk, at Abbey Rider Training (did I mention that)? Rat: The engine is a standard Bandit engine which has been rebuilt with low-compression turbo pistons and heavy duty rods. Rat: Standard Bandit five-speed box, completely unmodified! Rat: Don't know, don't think the scales would take the weight of my bike, especially not with me on it! Rat: Anyone who cares enough and Ady from PEST engineering in Gloucester. Rat: To be the quickest Bandit in Europe - what? Oh yeah, so it is (sorry Kev)! OK, the quickest Bandit in the world would be nice but I think Brock is a little way ahead of me yet. I'd also like to be the quickest woman in Super Street in this country. Does anyone know what I need to beat (I think the 8.66 gives you that one Rat - Features Ed)? The quickest woman on the planet is tempting but I think Scary and Helen are ever so slightly ahead of the game for that one. Also, you need slicks and bars for that, and we all know what bars are for don't we boys and girls? Rat: 8.66 - quickest Bandit in Europe (allegedly). 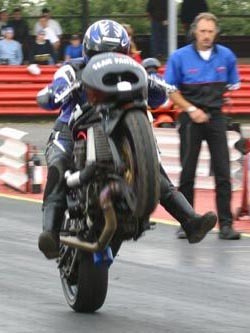 Oh yeah - and not falling off the back when Richard adjusted my clutch setting for the launch - nice one Rich! Rat: I dunno, I can never remember what happens in the pits (pass me a WKD or two)! Rat: People, pure and simple. Never would you get such a friendly and helpful bunch of people all in the same place at the same time. Rat: Scary Jane Head. 8.0, 7.5, 7.0, now that's what I call getting to grips with it - good girl (shame about the bars - tee hee)! Rat: Richard, Squirby, Ivan, Maria (and the kids of course), Andy, Beany Boy, Grumps and everyone who has helped me for the last three years (too many to list). Ady, Roy, Mark and PEST Engineering in advance for the help they are going to give me this season.